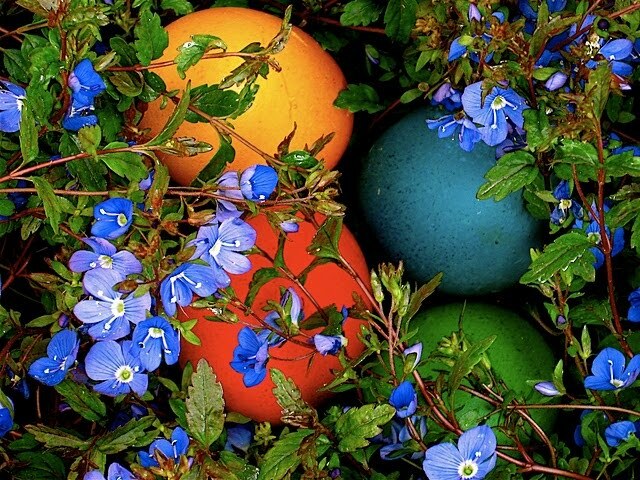 Since driving through Jim Thorpe, Pennsylvania, in a blizzard on Easter Sunday, I no longer assume we'll hide coloured eggs outdoors on the first holiday of spring. 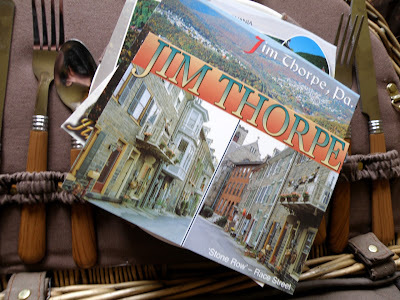 Several years ago, JJ and I were invited to Jim Thorpe, a rugged valley town, in the southwest Pocono Mountains, to pose as guests in a mystery theater weekend. In reality we were a pair of love-struck thespians playing a slick conman and a murderer. Jim Thorpe turned out to be a beguiling town we delighted in exploring. The entire place looked like an Old West stage set carved out of the mountains and propped up against a roaring river. While browsing the shops, I met a curvaceous, raven haired New Yorker who made custom corsets for a living. Her workshop was filled with silks, velvets, brocades, lace, feathers, and whale bone. She was looking forward to celebrating her fortieth birthday with her fifth husband in Philadelphia. Her name was Amber. We bonded over mugs of tea and meringues as big as my outstretched hand. I briefly wore the crimson velvet and black lace corset Amber made me twice. At this writing, it is mothballed in a storage unit in Sacramento. It's the perfect souvenir from a physically demanding, albeit irresistibly photogenic part of the world. Between clandestine rehearsals in the basement, we were instructed to blend in with the guests, doing what one does when getting away for the weekend. Eating. Drinking. Exploring. And a bit of shopping. All second nature to me. None of the sixty odd sleuths, paying to be hoodwinked, took JJ for a conman or me for the murderer. Our true identities were revealed during the sumptuous Easter brunch the inn put on for their guests. Alas, since we were working, neither JJ nor I had the opportunity to tank up before being outed. Once our true identities were revealed, along with the rest of the cast, we didn't get the chance to eat because the paying guests wanted to chat us up before checking out. Fortunately, the chef had thought ahead and made us a picnic. 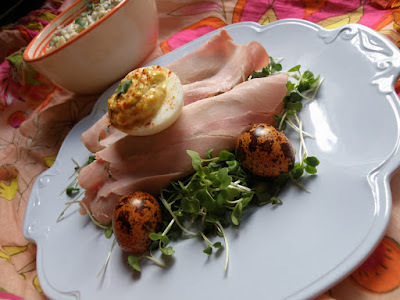 It consisted of deviled eggs (boiled eggs with the yolk hollowed out, mixed with mustard, mayo and spices, before returning to the ova to become a fetching canape) sliced ham off the bone, baby salad greens, and German potato salad. Had the weather been agreeable, we would have taken our picnic along the river. As it was we braved the elements and enjoyed the thoughtful meal on the partially sheltered veranda overlooking town. It took us nearly ten hours to travel 100 miles in a blizzard that Easter, but what we most remember about the day is the chef's generosity. She took the time, on one of the busiest days of the year, to feed us. As a result, I've always had a hankering to get back to Jim Thorpe. And every Easter, I make deviled eggs. I've made these eggs more times than I can count. They were a picnic favourite throughout my childhood (along with fried chicken) My mother always seasoned them with sweet paprika, but I prefer hot smokey paprika from Spain. Leftovers keep well wrapped in clingfilm for up to 24 hours. 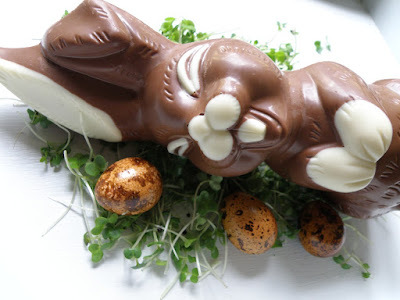 Longer than that, turn them into a gorgeous egg salad, spread open face on toasted, buttered hot cross buns. Gently place eggs in large stock pot. Cover with water (about an inch above eggs) Bring to full boil over medium heat. When water reaches boiling point, turn off the heat. Cover pan and allow eggs to sit in the hot water for 18 - 20 minutes. 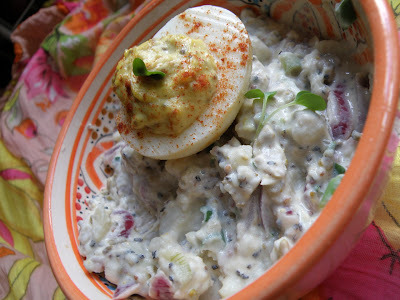 While eggs are cooking, combine mustard and mayonnaise, with salt in large bowl. Mix well. Wash your garnish and set it aside. After 18 - 20 minutes, bring pot to sink and fill with cold water, the colder the better. If you have ice cubes, add a few to the water. It is the cold water that helps separate the albumen from the shell. Give the eggs two minutes in the cold water, then peel --- or dye and devil later. When eggs are peeled, slice each one in half lengthwise. Scoop out the yokes with a teaspoon, or your fingers. Place the eggs whites on a large tray or platter. Toss the yokes in the bowl with mustard/mayo mixture. Using a fork mash the yolks, combining with the condiments. I don't mind some lumps and bumps in my deviled eggs. If you do, take a hand mixture to the filling and beat until smooth. Taste. I like the filling zesty and chunky. If you prefer yours smooth and silky, you might want to add a bit more mayo. When the filling suits your taste and texture, spoon into the eggs. 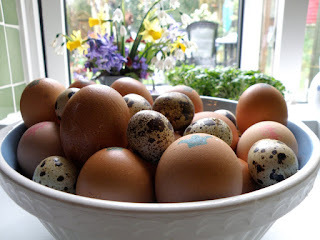 I usually start off sparingly, then go back and plump up any eggs that didn't get their fair share the first time around. Leftover whites can be chopped up and added to your potato salad. Sprinkle eggs with paprika and garnish with cress. 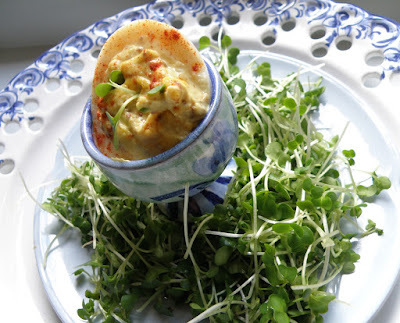 I have seen deviled eggs adorned with capers, shrimp, caviar, basil, and olives, such is their versatility. One summer, JJ and I made them with pesto and ate them wrapped in buttery lettuce leaves. Nothing else required. They were exquisite. Experiment. Recipes are ideas, not blueprints. I am not a big fan of potato salad, but since moving to England and discovering the enormous variety of potatoes grown here, my appreciation for spuds is at an all time high. 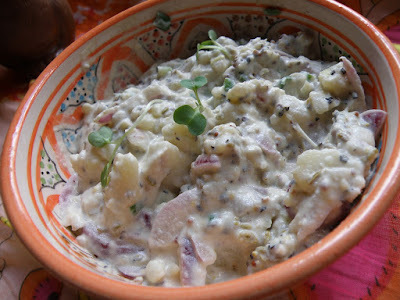 Still, even the best potato salad is twice as delicious wrapped in a thin slice of ham, pastrami, or salami. Make potato salad the day before you want to eat it. This allows the flavors to mature. Thoroughly wash potatoes. If organic, no need to peel. Place in steamer and steam until tender. This usually takes 25-30 minutes, depending on size and variety of new potatoes. If you don't have a steamer, boil the potatoes instead. While potatoes are cooking, peel and thinly slice red onion. Place in a large bowl. This will be your work and serving bowl. Wash spring onions. With scissors, snip onions into little bits. Add to red onions. Add sour cream, mustard, salt, pepper. Blend well. When potatoes are tender, add them to the bowl. Blend well with a knife, slicing roughly into bite size pieces as you go (assuming you didn't start out with miniature new potatoes) Allow salad to cool naturally. When it reaches room temperature, taste and adjust seasoning. Cover with cling film and refrigerate until next day. Garnish with fresh fennel before serving. To make ham roll ups, simply spoon potato salad on ham slices and roll them up. 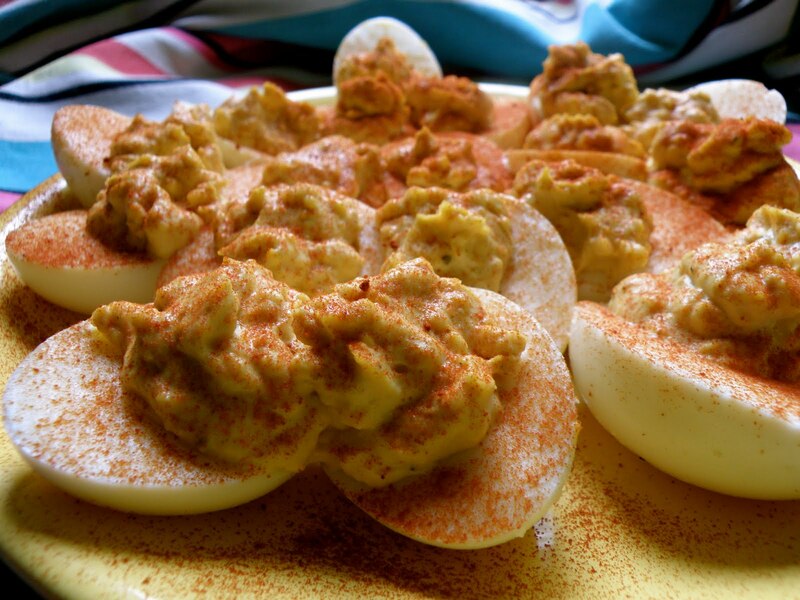 Serve with deviled eggs and you have the most Easterly of picnics. Do not forget chocolate. As I write, our house is filled with daffodils. The weather forecast for Easter weekend is cold, windy and rainy, but I am determined we'll have a California picnic in our book-filled, fairy-lighted, English lounge. I nearly always have cress growing on the kitchen windowsill. Not only does it make a wonderful, velvety salad, that needs no dressing, it is my all time favourite garnish. It's pretty, economical, tasty, and packed with nutrients. When the weather is dismal, bring the spirit of picnicing indoors. Cover your dining table with a brightly covered cloth, or quilt. Place flatware in glasses, vases, or mugs. 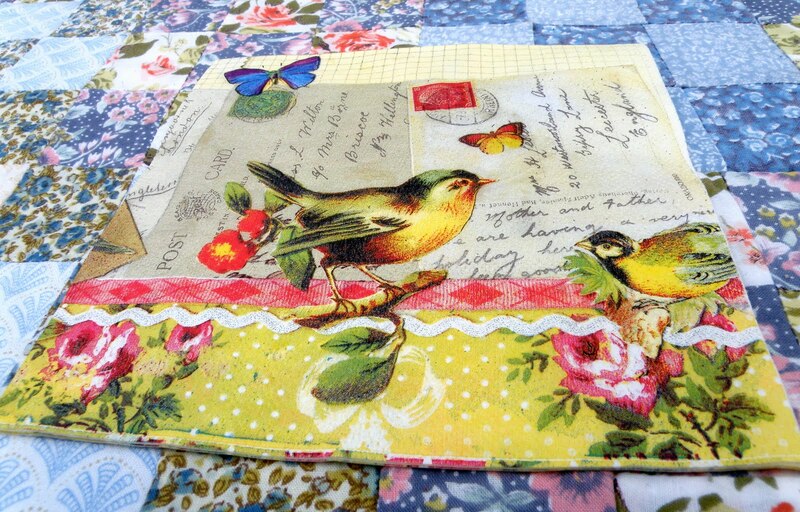 Lay out a stack of pretty paper napkins. Proudly display food and drink within easy reach. Have a variety of interesting non-alcoholic drinks on hand. My favourites are pink ginger sparkling spritzer, orange and passion fruit spritzer, cranberry lime spritzer, ginger beer, white grape juice, pomegranate juice, Dandelion & Burdock, and Sicilian lemonade. Pop in a nature soundtrack. Think tinkling brook and black birds. Mist the room with natural lavender, geranium or rose oil. Fill vases and jars with flowers, whatever is in season at the moment. Even in the darkest winter, you can pick up a couple of splashy potted amaryllis, or paperwhites (Narcisis) Paperwhites are the perfect indoor picnic flower. Play old fashion parlor, board and card games. Or reach for a poetry book and take turns reading randomly chosen poems and prose aloud. A game I used to love playing with my daughter, Antoinette, involves spinning a world globe, with your eyes closed. As the globe is spinning, without peeking, put your finger on a place, while making a declaration. Declarations are only as limited as your imagination. You might say something like, "Next year, I am taking you for a long holiday to . . . " If it turns out to be Nigeria, it will indeed be long. Or, you might say something like, "My secret lover lives in . . ." Is it Japan, Italy, Wyoming? The more chocolate you eat, the more inspiration you will bring to the game.